Ken Kerchevel, Steve Kanaly, Deborah Shelton, Linda Gray, Patrick Duffy, Cathy Podewell, Charlene Tilton and Ted Shackelford reunite to bid Larry Hagman farewell as J.R.
Dallas characters past and present unite to bid farewell to the iconic J.R. Ewing in an episode that launches a new mystery that teases the possible return of another beloved Dallas character. Bobby, Sue Ellen and their sons take a helicopter ride to the Mexican town where J.R.’s death has been reported. Investigators tell the Ewings his death was the result of a random robbery but they refuse to believe it… until the coroner reveals J.R.’s corpse to them. The great J.R. Ewing is indeed no longer alive! The Ewings ask Carlos Del Sol to keep the pressure on local authorities to discover the truth while they plan their final farewell to the Ewing patriarch. The Ewings suppress their conflicted emotions. God knows J.R. was a complicated man! John Ross is aghast when Sue Ellen decides to press on with her plan to seduce Gary (Ted Shackelford) into switching sides in their struggle with Bobby and Christopher over Ewing Energies. 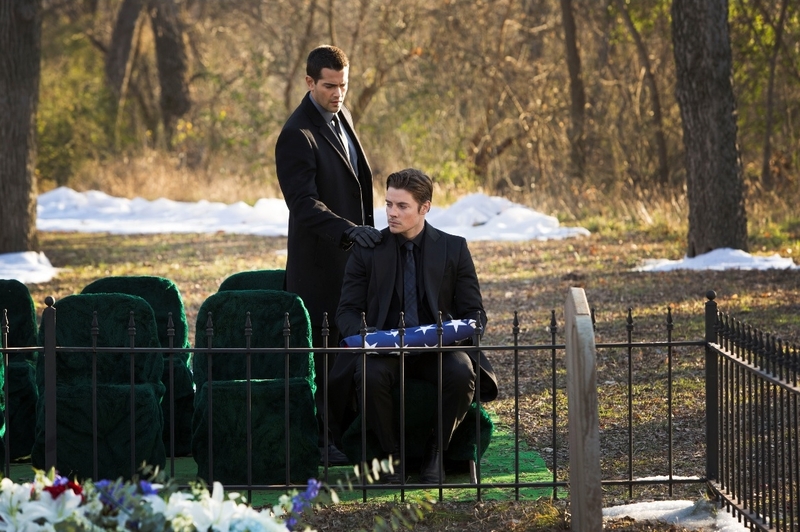 For once, John Ross puts his feelings before business. 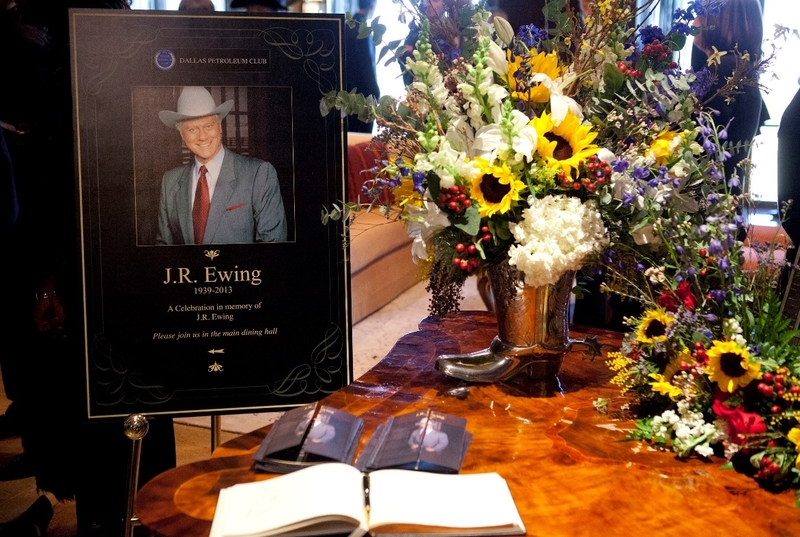 At the ritzy Dallas Petroleum Club, Dallas VIPs pay their respects to a man who helped put Dallas in a global spotlight. Lucy (Charlene Tilton) and Ray (Steve Kanaly) trade stories about J.R.’s infamous putdowns and are disturbed by Bobby’s aloof attitude. Ann recognizes the signs of denial in her husband’s behavior. John Ross rebuffs Elena and Pamela’s attempts to console him but shares one of Emma’s anti-anxiety pills. Emma needs them bad now that Drew threatened to shoot her dad when he showed up on Southfork trying to get her to return to him. Former J.R. flames Mandy Winger (Deborah Shelton) and Cally Harper (Cathy Podewell) reminisce with Sue Ellen about the man they all loved and lost. Mandy remarks that Sue Ellen at least got to make peace with J.R. before he died. Sue Ellen, meanwhile, admits to Gary that she’d like to “get honest” with him alone as the two alcoholics eye the booze flowing freely among the guests as per J.R.’s request. A Ewing event isn’t complete without Cliff Barnes crashing to badmouth J.R., of course, but he’s ushered out by Pamela in time for the Ewing men to get into an old-school brawl with other second-rate J.R. haters. Seems like old times! Later at Southfork, the Mexican authorities report to the Ewings that J.R. indeed was the victim of a petty crime but John Ross refuses to accept his iconic father would meet his end in such a pedestrian manner. A pill-popping Emma “comforts” him in the back of a parked jeep. And here I thought she was a good girl! Emma’s mother has less luck trying to get Bobby to come to terms with his conflicted feelings about his brother’s death, getting instead a torrent of rage from Bobby for keeping so much of her history a secret from him during their seven-year marriage. 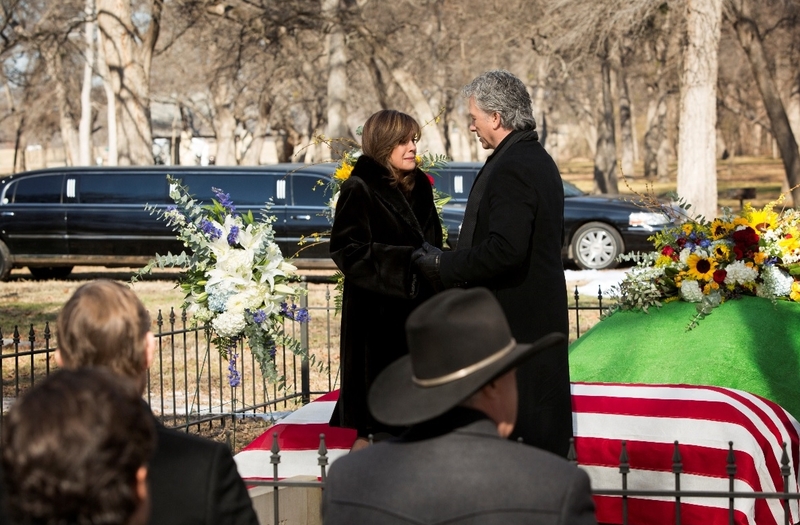 Linda Gray gave a tour de force performance as the grieving Sue Ellen. Sue Ellen sneaks into J.R.’s room to steel herself to read a sealed letter he had left for her before leaving for Abu Dabi. Seeing his belongings and a photo from their second wedding is too much for her and she loses her fight to resist drinking from a bottle of liquor in plain view. At the cemetery the next day, a hung-over Sue Ellen admits to being drunk as she reads the letter to the assembled Ewings. The letter reveals J.R.’s desire for a second chance with her and asks her to have dinner with him when he returns from his trip. Sue Ellen tearfully says her answer would have been yes and tells J.R. he was the love of her life. Kudos to Linda Gray for her subtle, spine-tingling performance in this scene, both underplayed and authentic in effect. Bobby, ever the knight in shining armor, gently helps her to her seat and asks himself how, being the yin to J.R.’s yang, he will be able to deal with a reality in which his brother know longer exists. Back at Southfork, J.R.’s flunky Bum arrives with a message from J.R. for Bobby, John Ross and Christopher. Bum reveals that J.R. had traveled to Abu Dabi in search of Christopher’s mother, Pam Barnes Ewing, and hands Bobby a sealed envelope that Bobby refuses to share with the Ewing cousins. Bobby tells Bum to keep mum about its contents until they have solved the mystery of J.R.’s murder, which appears to involve his plot to get Harris Ryland out of Bobby and Ann’s hair. Taking a stiff drink, Bobby finally dissolves into tears as he toasts J.R.’s final scheme. 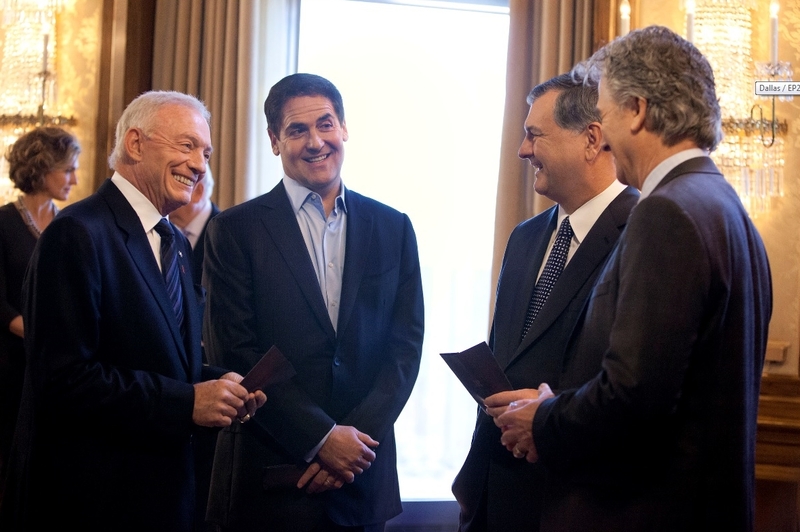 Dallas VIPs Jerry Jones (owner of the NFL’s Dallas Cowboys), Mark Cuban (owner of NBA Dallas Mavericks) and City of Dallas Mayor Mike Rawlings pay their respects to the Ewings. Cally Harper and Mandy Winger reminisce about J.R. in the March 11 episode. Sue Ellen tempts Gary as both of them are tempted by free-flowing booze at J.R.’s memorial. 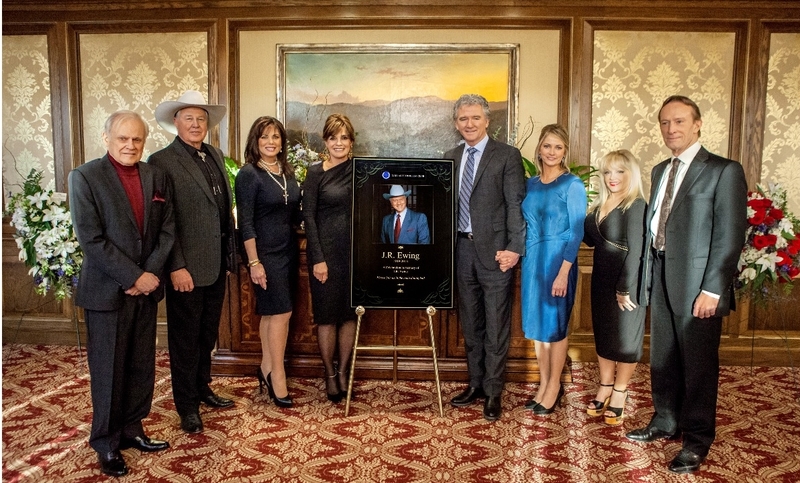 The Ewing Family remembers J.R.
← Flashback Friday: Philandering J.R. Ewing slept here… there… and everywhere!